If you still wonder how videos add credibility to your business, it's time to realize the significance behind one of the most valuable marketing tools. While using video to prove business credibility is far from new, the process continues to evolve with better ideas and technologies. The point to using videos on your website is they bring something real and visually compelling for differentiation from your competitors. We've been living in a visual culture now for more than three decades. In the Internet era, it's gone from flashy graphics to videos being able to tell a story. Storytelling is essential in business marketing to grab attention, and videos almost automatically bring this element which few other promotional tools can. Since we're living in a more mobile culture, people want information fast. They don't want to read thick paragraphs about what a business does, or even have to follow a long infographic explaining something technical. Let's look at what's possible with videos in 2016 and techniques you can incorporate into your web design to make them work better. You'll see many people say customer experiences are one way to bring the most amount of credibility to what a business offers. Letting a viewer experience something unique through transparency is one way to lend credence to your own sincerity. This occurs through storytelling once again and perhaps including information about your background in a short narrative. At the same time, it can mean taking people behind the scenes at your business as if getting a personal tour. The more you can create a "you are there" approach to your business, the more inviting you'll look. With customers being more scrutinizing on who they buy from today, you'll want to show exactly what occurs behind closed doors. Some of this can include how you make your products, interviews with your team leaders, or product demonstrations. In the latter case, you should use video to hone in on one thing to prove your credibility: solving customer pain points. The real beauty of videos is that you can demonstrate exactly how you'll solve problems for prospective customers. Using videos to address pain points immediately sets you apart from those who champion product features, yet don't demonstrate true value. Your best bet here is through customer testimonials and showing exactly what you did to solve a recurring problem for them. Make this valid by using real names and even using re-creations to show how a particular feature made solutions possible. With full-screen videos being a popular design technique on websites, you can also wrap a story around the testimonials to give it a mesmerizing movie-like quality. 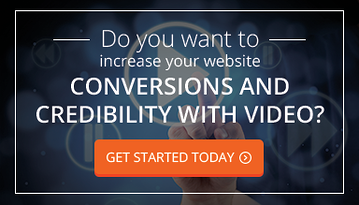 There isn't any doubt that video sharing gets the word out faster about your business. Statistics from last year showed mobile videos get shared 92% of the time compared to any other media format. That gives more potential for your video to go viral on social media where you can get recognition in a matter of hours. Unique content counts, though, so coming up with creative storytelling ideas will get you noticed faster on places like YouTube. Don't hesitate to use some comedy since the track record is good using this method. Five years ago already, B2B companies went for comedy in various marketing videos. It was unusual then for a typically buttoned-down industry, but it brought a new wave of creative humor videos to entice leads to take buying action. Always remember at the end of the day it is about creating content for your buyer personas. Use your current marketing metrics to determine which topics may be of interest to your target and create videos around what will engage them.